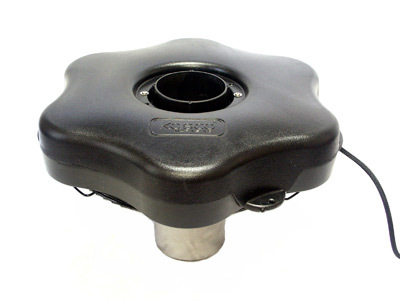 Kasco Marine's 3400VFX, 3/4 hp Floating Aerating Fountain or Decorative Fountain Aerator is great for small to medium sized ponds. The 3400VFX is a Kasco mainstay. 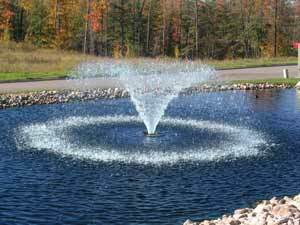 The classic Kasco "V" fountain pattern, now a larger 6' Tall x 21' Wide gives this model a beautiful aerating fountain pattern. 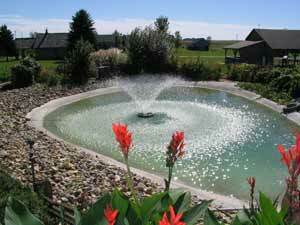 The aerating fountain pattern will assist in improving your water quality as well as adding to the aesthetic appeal of your pond. 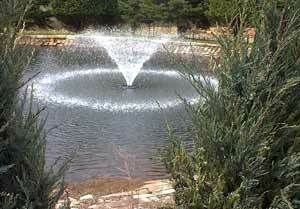 Kasco's 3400VFX Floating Aerating Fountain does a great job of adding oxygen and improving your pond or lake aeration. 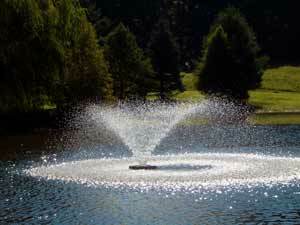 The 3400VFX Floating Aerating Fountains are available in 120V or 240V, 60Hz models as well as 240V, 50Hz European models. 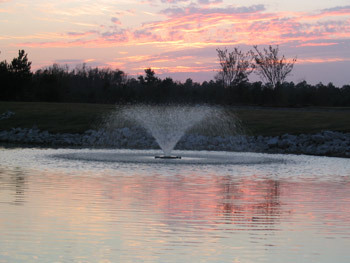 Click here to download a NEW Kasco 3400VFX Floating Aerating Fountain brochure. Adding a LR-275 Low Voltage Light Kit to the 3400VFX Floating, Aerating Fountain adds a touch of class to this beautiful fountain display during the nighttime hours. The LR-275 Low Voltage Light Kit includes two machined, bronze, light fixtures with 75 Watt MR-16 Halogen bulbs in each fixture. The LR-275 Low Voltage Light Kit has a built in transformer for easy installation. The LR-375 Low Voltage Light Kit can also be used for more light. Two clear MR-16 bulbs are included with each LR-275 Low Voltage Light Kit (3 with LR-375), however, you can chose any or all of the optional colors of Red, Green, Blue, & Yellow.. 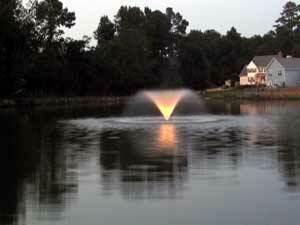 The 3400VFX, 120V Floating Aerating Fountain, as all Kasco Floating Fountains, includes a GFCI protected control box. The C-25, 120V Control with Timer, GFCI protection, and Photo Eye for light operation, comes standard with the 3400VFX Floating Aerating Fountain. The Photo Eye allows you to set your timer for the hours of operation and when, during those hours, it is dark, the Photo Eye will turn on the LR-275 Low Voltage Light Kit. No electrician is required to install your C-25 Control or your 3400VFX Fountain if an existing 120V, 15 amp receptacle is available. 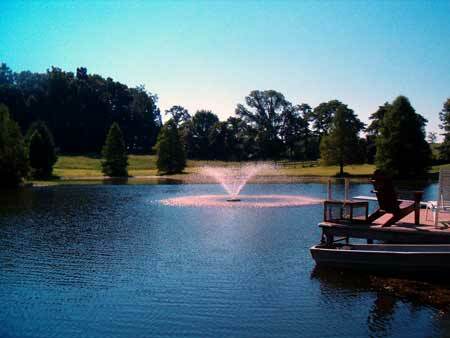 The 3400HVFX, 240V Floating Aerating Fountain also includes a GFCB protected control panel. The C-85, 240V Control Panel with Timer, GFCB protection, 120V GFI Protected Outlet for Lights, and Photo Eye for light operation comes standard with the 3400HVF Floating Aerating Fountain. 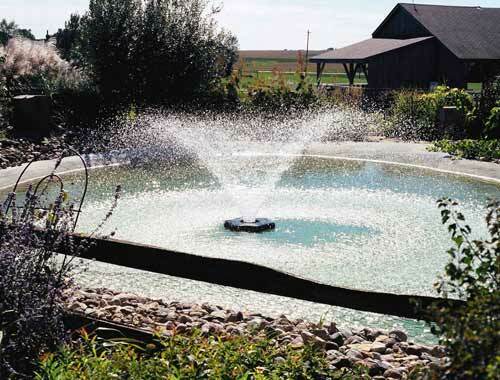 Kasco recommends a licensed electrician to install the C-85 Control Panel and the 3400HVFX if you plan to hard-wire the Floating Aerating Fountain into the C-85 Control Panel. • Successful shallow water operation in as little as 18"